Oceania Cruises is a premium cruise line based in Miami, Florida, that operates six premium cruise ships on worldwide itineraries. While it also offers cruises as short as ten days, the norm is 10- to 14-days and the line is also known for its long cruises lasting up to 195 days. The line's President and CEO is Bob Binder; he is vice-chairman and also a co-founder of the brand. Since September 2014, Oceania Cruises has been a wholly owned subsidiary owned of Norwegian Cruise Line Holdings, which also owns Norwegian Cruise Line and Regent Seven Seas Cruises. 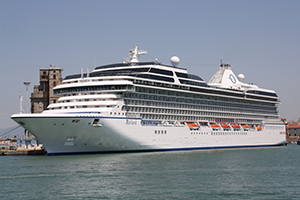 Oceania Cruises was founded in 2002 by luxury cruise industry veterans Frank Del Rio, Bob Binder, and Joe Watters. The founding management team also included industry veterans Robin Lindsay, James Rodriguez, Jeff Drew, and Howard Sherman. In November 2005, a third R-class ship entered service for Oceania Cruises when the company chartered the R Five from Cruiseinvest and renamed her Nautica. 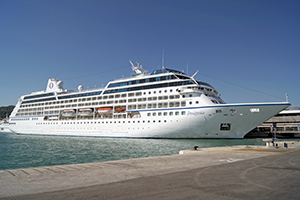 At the naming ceremony of the Nautica, Frank del Rio announced the plan of adding a fourth ship, Marina, to the Oceania Cruises fleet in July 2007. This, however, did not come to pass. 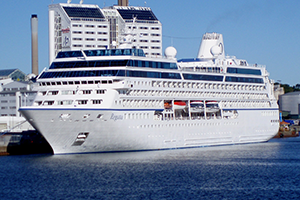 In February 2007, the majority of Oceania Cruises' stock was sold to the New York-based Apollo Management. The following month Oceania made a memorandum agreement with the Fincantieri shipyard in Italy to construct two new 1,250-passenger ships. The contract was finalized in June 2007, with delivery dates for the new Oceania Class ships set for January 2011 and July 2011. The contract also includes an option for a third vessel of the same type that could be delivered in May 2012, but Oceania declined the option. After being leased out for two years to Hapag-Lloyd as the Columbus 2, the Insignia returned to the fleet in 2014. In May 2014 it was announced that Oceania and Fincantieri are close to making a deal on two additional ships for the Oceania Class. The order for these additional ships never came to pass. On September 2, 2014, Norwegian Cruise Line Holdings purchased Prestige Cruise Holdings, the parent company of Oceania Cruises and Regent Seven Seas Cruises, for $3.025 billion. On November 25, 2014, Norwegian Cruise Line Holdings Ltd announced a definitive agreement with Princess Cruises to purchase the Ocean Princess for Oceania Cruises, upon delivery in March 2016, the ship underwent a 35-day, $40 million refurbishment in Marseille, France to become the Sirena. In August 2018, Oceania Cruises announced its intention to renovate each of its four ships as a part of the $100 million "OceaniaNEXT" program. On Jan. 8, 2018, Oceania Cruises announced it has ordered two new ships to be built at Fincantieri shipyards at a cost of more than $650 million per ship. The ships will be 67,000 gross tons and have a 1,200-passenger capacity. They are due in 2022 and 2025. The Regatta class ships were built in 1998—2000 for Renaissance Cruises as a part of their R class. They have a gross tonnage of 30,277 and can accommodate a maximum of 824 passengers in 343 cabins. The Oceania class consists of two 1,250-passenger, 66,084 gross ton ships built by Fincantieri in Italy, with the first, MS Marina, delivered in January 2011, and the second, MS Riviera, delivered in May 2012. These were the first ships built for Oceania. 580 of the 625 cabins and suites have private balconies. Two 1,200-passenger, 67,000 gross ton ships were ordered from the Fincantieri shipyard in Italy, with the first to be delivered in 2022 and the second to be delivered in 2025. 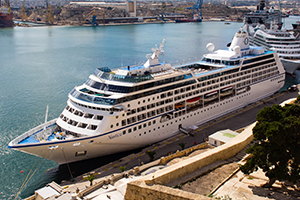 In December 2016, it was announced that Oceania Cruises has reached an agreement with the Cuban government. 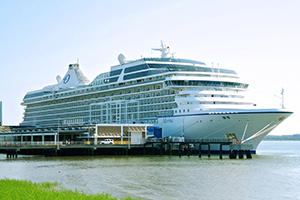 In March 2018, Oceania Cruises announced a 180-day world cruise in 2020 with calls at 95 ports in 38 countries on 4 continents.